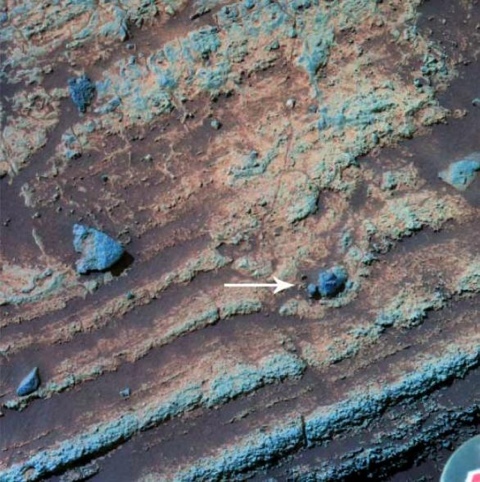 Michael Manga et al from the Integrative Planetary Science at Caltech Berkeley have used this image of the ‘Home Plate’ rock on Mars to infer the atmospheric density. The indicated rock or ‘clast’ was shot from a volcano and landed in a wet sedimentary environment producing what is called a ‘bomb sag’. By performing a number of controlled experiments the researchers have bracketed the wetness of the substrate and the density of the clast. As a result they determined that the impact velocity of the ‘bomb’ was “up to 40 m/s” which means that the air density exceeded 0.4 kg/m^3, much higher than the present density on Mars 0.013 kg/m^3. It is a well established fact that the liquid phase of water cannot exist at the present atmospheric density and temperatures on Mars. For reference, atmospheric density on Earth is 1.2 kg/m^3. This innovative approach indicates that volcanic activity occurred when the atmospheric density on Mars was declining. Unfortunately, this scientific paper, as are all concerning the planets, is flawed by the introduction of the completely unproven ‘Uniformitarian Assumption’, that these events occurred billions of years BP (Before the Present). Why are rock formations like ‘Home Plate’ so exposed, when dust storms containing 10^17 grams repeatedly cover the entire planet. These storms should gradually spall off more and more material, causing the dust to deepen over billions of years and obscure the entire rocky surface. The CC scenario is based on dozens of ancient texts which are actually observations of consuming cosmic events that took place between 3700 and 700 BC. There is an complete dichotomy between this period, ruled by the ‘gods’ (glowing bodies) and the modern view because these planets, Venus, Mars and Mercury have retreated to distant orbits. Julian Jaynes was compelled to explain this dichotomy in The Origin of Consciousness in the Breakdown of the Bicameral Mind (some 490 pages), suggesting it was the result of a sudden complete change in the minds of all human beings! But the texts show that the ancient people were not only rational, but because of the same close cosmic encounters witnessed by one hundred generations, they knew far more than present-day scientists about the planets. I liken the one-hundred cyclic encounters with the living planet priori-Mars (Mars still had its solid iron core), to the SETI program receiving a digital signal of 100. In which case all hell would break loose! Of course, because the power and intelligence of our wonderful ‘scientific establishment’ could never cause or even conceive of such events, they could not have happened – what arrogance. The purpose of these encounters with priori-Mars was to rejuvenate a rather sickly Earth by sacrificing all the valuable assets of a smaller living planet, i.e. the oceans, atmosphere and biosphere in the form of seeds. It should be obvious to any thinking person that this could only be accomplished by a number of cyclic encounters because of the direct and indirect tidal effects. Only water from the near-side could be attracted to the Earth whereas that on the far side was ‘pushed away’. Thus a break in priori-Mars geostationary orbits into an intersecting planetary orbit was necessary for the water on the planet to be redistributed, making more available during the next 15 years capture. Anyone who has read my website and/or blog posts knows that the entire encounter process was quite complex, and that this point is one of many. Geologists have noted a sea-level rise of some 150 meters in the recent geologic past, e.g. the Mediterranean used to be three isolated lakes and a number of ancient ports are now under water, but the change is attributed to the melting of glaciers thought to have covered the northern Eurasian continent. This 3000-year water-level increase on Earth was superimposed upon by cyclic changes due to the ‘permanent’ tide surrounding the Tibetan-Himalayan complex, caused by the geostationary presence of priori-Mars only 44,000 km from the Earth and the corresponding shift of the spin axis of the rigid outer shell to Hudson Bay. Evidence of these lie in the Messinian Salinity Crisis, and the Siwalik sediments surrounding the Tibetan-Himalayan complex. 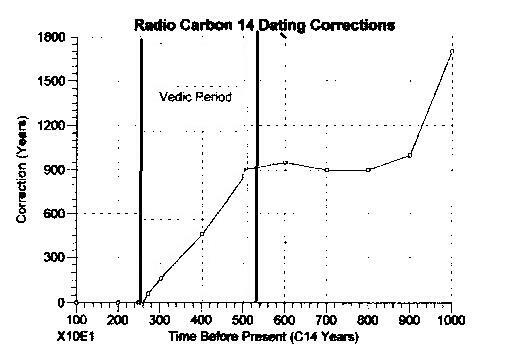 The most obvious consequence of the influx of volatiles from priori-Mars to the Earth between 3700 and 700 BC exists as a correction to the radiocarbon dating curve. If the composition of the atmosphere had not changed during this period, the correction factor plotted as a function of the date, shown in figure 2 should be perfectly flat. But as can be seen the composition is changing continually between these dates. The ‘bomb’ pictured in Figure 1 fell from an erupting Martian volcano during the Vedic Period (3700 to 700 BC) and impacted ‘Home Plate’ when very wet, at a date when its atmosphere and water had been partially lost to the Earth. This did not occur on ‘early’ Mars but only yesterday, geologically speaking. Common Grace is the grace of God that is common to all humankind without distinction between persons, believers or unbelievers. It is “grace” because it is undeserved and sovereignly bestowed by God. ~ by Angiras on May 10, 2012.